H. Rick Bamman - hbamman@shawmedia.com Johnsburg's running back Jack Kegel finds an opening in the Rochester defense in the first quarter in the Class 4A State Football final Friday, Nov. 25, 2016. H. Rick Bamman - hbamman@shawmedia.com Johnsburg's Conner Bell catches a Riley Buchanan fourth quarter pass for a 43 yard gain in the Class 4A State Football final Friday, Nov. 25, 2016. 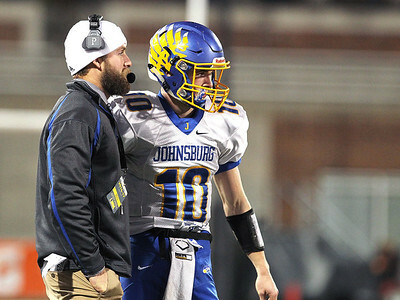 H. Rick Bamman - hbamman@shawmedia.com Johnsburg head coach Dan DeBoeuf sends in a play with quarterback Riley Buchanan in the first half against Rochester in the Class 4A State Football final Friday, Nov. 25, 2016. 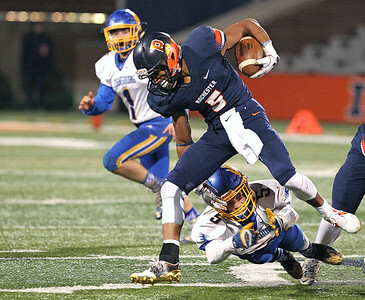 H. Rick Bamman - hbamman@shawmedia.com Johnsburg's Jack Kegel trips up Rochester's Avante Cox late in the fourth quarter in the Class 4A State Football final Friday, Nov. 25, 2016. 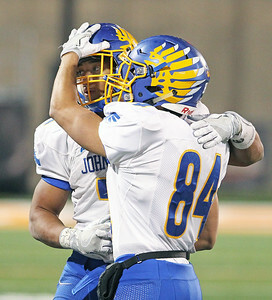 Johnsburg lost, 38-14. 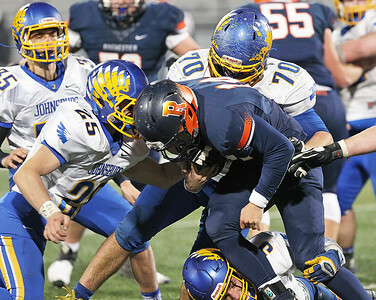 H. Rick Bamman - hbamman@shawmedia.com Johnsburg's Joe Moore (70) blocks Rochester's Mikey McNicholas to create an opening for running back Alex Peete in the first quarter in the Class 4A State Football final Friday, Nov. 25, 2016. H. Rick Bamman - hbamman@shawmedia.com Rochester's Skylor Caruso is called for a facemask as he tackels Johnsburg's quarterback Riley Buchanan in the Class 4A State Football final Friday, Nov. 25, 2016. 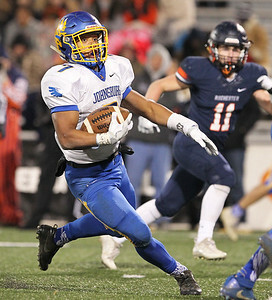 H. Rick Bamman - hbamman@shawmedia.com Johnsburg's Alex Peete gains 22 yards and a touchdown in the first quarter against Rochester in the Class 4A State Football final Friday, Nov. 25, 2016. H. Rick Bamman - hbamman@shawmedia.com Johnsburg's Alex Peete (left) and Nico LoDolce hug in the closing minutes of the fourth quarter in the Class 4A State Football final Friday, Nov. 25, 2016. 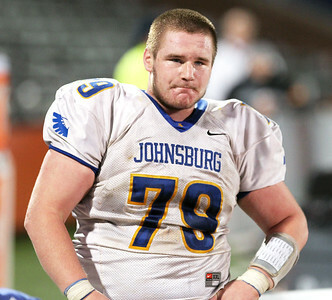 Johnsburg lost 38-14 to Rochester. 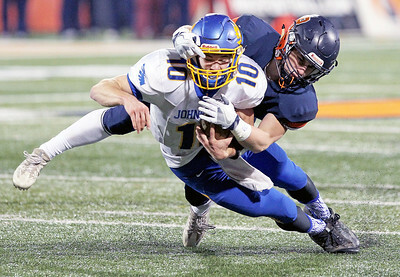 H. Rick Bamman - hbamman@shawmedia.com Johnsburg'sAustin Butler (25) Joe Moore (70 and Jack Kegel (5) smother Rochester's Josh Grant late in the fourth quarter in Johnsburg's 38-14 to Rochester in the Class 4A State Football final Friday, Nov. 25, 2016. 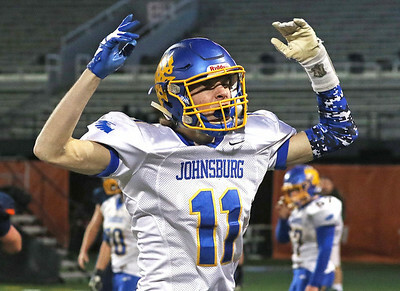 H. Rick Bamman - hbamman@shawmedia.com Johnsburg's Joe Calhoun pumps up the crowd after a blocked punt in the fourth quarter. 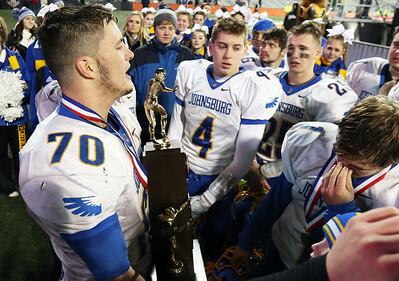 Johnsburg lost 38-14 to Rochester in the Class 4A State Football final Friday, Nov. 25, 2016. H. Rick Bamman - hbamman@shawmedia.com Johnsburg's Dyllan Hess reflects on the sideline in the closing minute of the Class 4A State Football final Friday, Nov. 25, 2016. 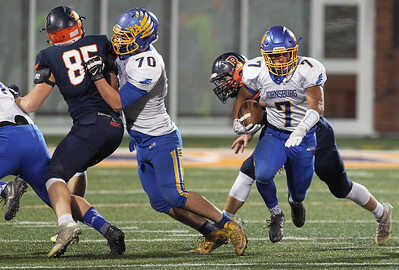 Johnsburg lost 38-14 to Rochester. 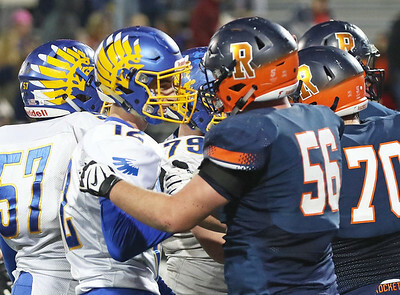 H. Rick Bamman - hbamman@shawmedia.com Johnsburg's Adam Jayko (left) and Rochester's Austin Mathis shake hands in the closing minutes of the fourth quarter. 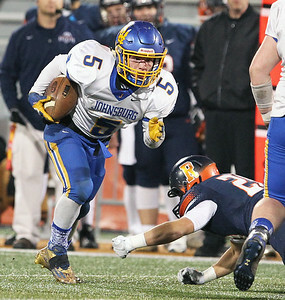 Johnsburg lost 38-14 to Rochester in the Class 4A State Football final Friday, Nov. 25, 2016. H. Rick Bamman - hbamman@shawmedia.com Johnsburg head coach Dan DeBoeuf addresses his team after their second place finish in the Class 4A State Football final Friday, Nov. 25, 2016. 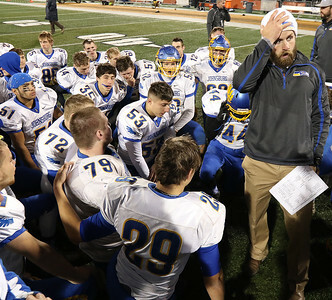 H. Rick Bamman - hbamman@shawmedia.com Holding the second place state trophy Johnsburg team captian Joe Moore addresses teammates after the 38-14 loss to Rochester in the Class 4A State Football final Friday, Nov. 25, 2016. 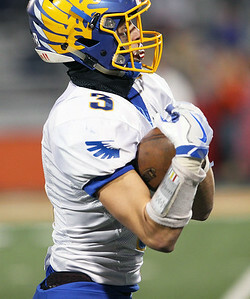 Johnsburg's Conner Bell catches a Riley Buchanan fourth quarter pass for a 43 yard gain in the Class 4A State Football final Friday, Nov. 25, 2016.